At least the patch distracts from his baldness, maybe that is why he’s giving up smoking. 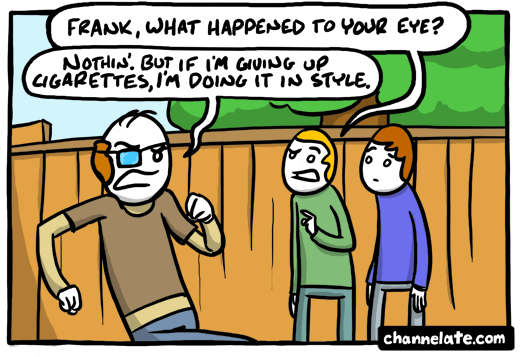 First that popped into my head reading this: He stuck the cigarette INTO his eye to help quit. Certainly one way of doing it. Oh yeah, I can see how it comes off that way. Everyone who quits smoking walks like that, all the time. That’s why I’ll never quit. ITir8y Nice! Just wanted to respond. I thoroughly loved your post. Keep up the great work.